Qin's wars of unification were a series of military campaigns launched in the late 3rd century BC by the Qin state against the other six major states — Han, Zhao, Yan, Wei, Chu and Qi — within the territories that formed modern China. By the end of the wars in 221 BC, Qin had unified most of the states and occupied some lands south of the Yangtze River. The territories conquered by Qin served as the foundation of the Qin dynasty. China in the Warring States period. Many of the smaller states, such as Ba and Zhongshan, had been conquered by the time of Ying Zheng's reign. In particular, Ba and Shu were conquered by Qin, Zhongshan by Zhao, Lu by Chu, and Song by Wei and Qi. Over the course of the Warring States period, the Qin state had evolved to become the most powerful of the seven major states in China. In 238 BC, Ying Zheng came to the throne of Qin after eliminating his political rivals Lü Buwei and Lao Ai. With help from Li Si, Wei Liao (尉繚) and others, Ying Zheng formulated a plan for conquering the other six major states and unifying China. The plan, which focuses on annexing each state individually, is based on "allying with distant states and attacking nearby ones", one of the Thirty-Six Stratagems. Its key steps were: ally with Yan and Qi; hold down Wei and Chu; conquer Han and Zhao. 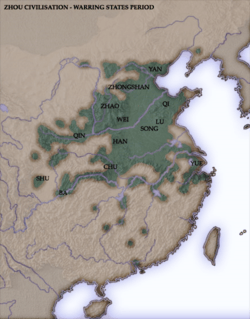 Han was the weakest of the seven states and had previously been subject to numerous attacks by Qin, which caused it to be drastically and further weakened. In 230 BCE, the Qin army led by Interior Minister Teng (內史騰) moved south, crossed the Yellow River and conquered Zheng (鄭; present-day Xinzheng, Zhengzhou, Henan), the capital of Han, within one year. King An of Han surrendered and Han came under Qin's control. The territory of Han was reorganised to form the Qin Empire's Yingchuan commandery (潁川郡), with the commandery capital at Yangzhai (陽翟; present-day Yuzhou, Xuchang, Henan). In 236 BCE, while Zhao was attacking Yan, Qin used the opportunity to send two separate forces to invade Zhao. The Qin army led by Wang Jian conquered the Zhao territories of Eyu (閼與; present-day Heshun County, Jinzhong, Shanxi) and Liaoyang (撩陽; present-day Zuoquan County, Jinzhong, Shanxi), while the other Qin army under the command of Huan Yi (桓齮)[lower-alpha 2] and Yang Duanhe (楊端和) captured Ye (鄴; present-day Ci County, Handan, Hebei) and Anyang (安陽; present-day Anyang County, Anyang, Henan). Zhao lost nine cities and its military prowess was weakened. Two years later, Qin planned to attack Han, but feared that Zhao might render support to Han, so it ordered Huan Yi to lead an army to attack Zhao's Pingyang (平陽; southeast of present-day Ci County, Handan, Hebei) and Wucheng (武城; southwest of present-day Ci County, Handan, Hebei). More than 100,000 soldiers were killed in the battle. The Zhao army was defeated and its commander, Hu Zhe (扈輒), was killed in action. In 233 BCE, Huan Yi's army crossed Mount Taihang and conquered the Zhao territories of Chili (赤麗) and Yi'an (宜安), both located southeast of present-day Shijiazhuang, Hebei. In 232 BC, the Qin forces split into two groups to attack Fanwu (番吾; present-day Lingshou County, Handan, Hebei) and Langmeng (狼孟; present-day Yangqu County, Taiyuan, Shanxi), but were defeated by the Zhao army led by Li Mu. Huan Yi fled to Yan to escape punishment for his defeat. However, the Zhao forces also sustained heavy losses and could only retreat to defend their capital, Handan. Han was conquered by Qin. Zhao was conquered by Qin. Wei was conquered by Qin. Chu was conquered by Qin. Yan and Dai were conquered by Qin. Wuyue was conquered by Qin. China was unified under the Qin dynasty. In the following two years, Zhao was struck by two natural disasters — an earthquake and a severe famine. In 229 BC, Qin took advantage of the situation to launch a pincer attack from the north and south on Handan, Zhao's capital. Three Qin armies embarked from Shangdi (上地; in present-day northern Shaanxi), Jingxing (井陉; present-day Jingxing County, Shijiazhuang, Hebei) and Henei (河內; present-day Xinxiang, Henan), respectively led by Wang Jian, Jiang Lei (羌瘣) and Yang Duanhe, to coordinate the attack on Handan. Li Mu and Sima Shang (司馬尚) were put in command of the Zhao army. Li Mu ordered his troops to build defensive structures and avoid direct confrontation with the enemy. The Qin forces were unable to advance further and both sides reached a stalemate. The Qin state bribed Guo Kai (郭開), a Zhao minister, to sow discord between King Qian of Zhao (趙王遷) and Li Mu. The king doubted Li Mu's loyalty and ordered Li to hand over his authority to his deputies, Zhao Cong (趙蔥) and Yan Ju (顏聚). When Li Mu refused to obey, the king became more suspicious of him and ordered his men to take Li by surprise and capture him. Li Mu was executed in prison later on King Qian's order. In 228 BCE, after learning that Li Mu had been replaced, the Qin forces attacked, defeated the Zhao army and conquered Dongyang (東陽; east of Mount Taihang). Zhao Cong was killed in action while Yan Ju escaped after his defeat. Seven months later, Qin forces occupied Handan and captured King Qian, bringing an end to Zhao's existence. Prince Jia, King Qian's elder brother, escaped from Handan and went to Dai (代; present-day Yu County, Zhangjiakou, Hebei), where, with help from Zhao's remnants, he declared himself "King of Dai". In 222 BC, Dai was conquered by the Qin army led by Wang Jian's son, Wang Ben (Qin) (王賁). Prince Jia was taken captive. In 228 BC, after the fall of Zhao, the Qin army led by Wang Jian and stationed in Zhongshan prepared for an offensive on Yan. Ju Wu (鞠武), a Yan minister, proposed to King Xi of Yan to form alliances with Dai, Qi and Chu, and make peace with the Xiongnu in the north, in order to counter Qin's invasion. However, Crown Prince Dan felt that the alliance strategy was unlikely to succeed, so he sent Jing Ke to assassinate Ying Zheng, the king of Qin. Jing Ke went to Qin by pretending to be an envoy, bringing with him a map of Dukang[lower-alpha 3] and the head of Fan Wuji,[lower-alpha 4] a turncoat Qin general. Jing Ke failed and died in his attempt on Ying Zheng's life. In 226 BC, using the assassination attempt as an excuse, Ying Zheng ordered Wang Jian to lead an army to attack Yan, with Meng Wu (蒙武) as Wang's deputy. The Qin forces defeated the Yan army and Yan's reinforcements from Dai in a battle on the eastern bank of the Yi River (易水), after which they conquered Ji (薊; present-day Beijing), the capital of Yan. King Xi of Yan and his son, Crown Prince Dan, led their remaining forces on a retreat to the Liaodong Peninsula. A Qin army led by Li Xin (李信) pursued the retreating Yan forces to the Yan River (衍水; present-day Hun River, Liaoning), where they engaged enemy forces and destroyed the bulk of Yan's army. Later, King Xi ordered Crown Prince Dan's execution and sent his son's head to Qin as an "apology" for the assassination attempt. Qin accepted the offer and did not attack Yan for the next three years. In 222 BCE, the Qin army led by Wang Ben (王賁) invaded Liaodong and destroyed Yan's remaining forces and captured King Xi, bringing an end to Yan's existence. The former territories of Yan were partitioned and reorganised to form the Qin Empire's Yuyang (漁陽), Beiping (北平), Liaoxi (遼西) and Liaodong (遼東) commanderies. In 225 BCE, a 600,000 strong Qin army led by Wang Ben (王賁) conquered more than ten cities on the northern border of Chu as a precautionary move to guard the flank from possible attacks from Chu while Qin was invading Wei. Wang Ben then led his forces north to attack and besiege Daliang (大梁; northwest of present-day Kaifeng, Henan), the capital of Wei. As Daliang was situated at the concourse of the Sui and Ying rivers and the Hong Canal (鴻溝), its geographical location gave it a natural defensive advantage. Besides, the moat around Daliang was very wide and all the five gates of the city had drawbridges, making it even more difficult for Qin forces to penetrate the city. The Wei troops used the opportunity to strengthen their fortifications and defences. Wang Ben came up with the idea of directing the waters from the Yellow River and the Hong Canal to flood Daliang. Wang Ben's troops worked for three months to redirect the water flow while maintaining the siege on Daliang, and succeeded in their plan. Daliang was heavily flooded and over 100,000 people died, including civilians. King Jia of Wei (魏王假) surrendered and Wei came under Qin's control. Qin established the commanderies of Dang (碭) and Sishui (泗水) in the former Wei territories. In 224 BC, Ying Zheng called for a meeting with his subjects to discuss his plans for the invasion of Chu. Wang Jian felt that they needed at least 600,000 troops for the campaign, while Li Xin (李信) claimed that less than 200,000 men would suffice. Ying Zheng dismissed Wang Jian's idea and ordered Li Xin and Meng Wu (蒙武) to lead an army of about 200,000 to attack Chu. Wang Jian retired on the grounds of illness. The Qin armies scored initial victories as Li Xin's force conquered Pingyu (平輿; north of present-day Pingyu County, Zhumadian, Henan) while Meng Wu's captured Qinqiu (寢丘; present-day Linquan County, Fuyang, Anhui). After conquering Yan (鄢; present-day Yanling County, Xuchang, Henan), Li Xin led his army west to rendezvous with Meng Wu at Chengfu (城父; east of present-day Baofeng County, Pingdingshan, Henan). The Chu army, led by Xiang Yan (項燕), had been avoiding using its main force to resist the Qin invaders while waiting for an opportunity to launch a counterattack. During this time, Lord Changping, a relative of Ying Zheng who descended from the Chu royal family, incited a rebellion in a city previously conquered by Li Xin. He also prepared for a surprise attack on Li Xin later. The Chu army led by Xiang Yan secretly followed Li Xin at high speed for three days and three nights before launching a surprise attack. Lord Changping's forces followed suit from behind and joined Xiang Yan's army in attacking Li Xin. Most of Li Xin's forces were destroyed in the battle. Upon learning of Li Xin's defeat, Ying Zheng personally visited Wang Jian, who was in retirement, apologised for not heeding Wang's advice earlier, and invited Wang back to serve in the court. Per Wang Jian's request, Ying Zheng put him in command of 600,000 troops and assigned Meng Wu to be Wang's deputy. Wang Jian was aware that the king would doubt his loyalty because he wielded too much military power, so he frequently sent messengers back to the king, requesting for rewards for his family so as to reduce the king's suspicions. In 224 BC, Wang Jian's army passed through the south of Chen (陳; present-day Huaiyang County, Zhoukou, Henan) and made camp at Pingyu. The Chu forces, led by Xiang Yan, used their full strength to launch an offensive on the Qin camp but failed. Wang Jian ordered his troops to defend their positions firmly and avoid advancing further into Chu territory. After failing to lure the Qin army to attack, Xiang Yan ordered a retreat and Wang Jian seized the opportunity to launch a surprise counterattack. The Qin forces pursued the retreating Chu forces to Qinan (蕲南; northwest of present-day Qichun County, Huanggang, Hubei), where Xiang Yan was killed in action[lower-alpha 5] in the ensuing battle. In 223 BC, Qin launched another attack on Chu and captured Shouchun (壽春; present-day Shou County, Lu'an, Anhui), the capital of Chu. Fuchu, the king of Chu, was captured and Chu was annexed by Qin. The following year, Wang Jian and Meng Wu led the Qin army to attack the Wuyue region (covering present-day Zhejiang and Jiangsu), which was inhabited by the Baiyue, and captured the descendants of the royal family of Yue. The conquered Wuyue territories became the Qin Empire's Kuaiji Commandery. In 264 BC, Tian Jian ascended the throne of Qi and was assisted by his mother, the queen dowager, in managing state affairs. Qin bribed Hou Sheng (後勝), the Qi chancellor, to dissuade King Jian from helping the other states while they were being attacked by Qin. By 221 BC, Qi was the only state in China that had yet to be conquered by Qin. Qi hurriedly mobilised its armies to its western borders as a safeguard against a possible Qin invasion, even though its military was not well equipped and morale was low. In the same year, Ying Zheng used Qi's rejection of a meeting with a Qin envoy as an excuse to attack Qi. The Qin army, led by Li Xin (李信), avoided direct confrontation with enemy forces stationed on Qi's western borders, and advanced into Qi's heartland via a southern detour from Yan. The Qin forces met with little resistance as they passed through Qi territory and eventually arrived at Linzi (north of present-day Zibo, Shandong), the capital of Qi. King Jian was caught by surprise and, after being persuaded by Hou Sheng, he surrendered to Qin without putting up a fight. The former territories of Qi were reorganised to form the Qin Empire's Qi (齊) and Langya (琅邪) commanderies. In 221 BC, after the conquest of Qi, Ying Zheng proclaimed himself "Qin Shi Huang" (秦始皇; lit. "First Emperor of Qin") and established the Qin dynasty. The Qin Empire was divided into 36 prefectures, with Xianyang as its capital. Qin Shi Huang created a centralised state and empire that would become the bedrock of future Chinese dynasties. Although the Qin dynasty lasted for 15 years only, its influence on Chinese history lasted for centuries to come. In 209 BC, during the reign of Qin Er Shi, Qin Shi Huang's son and successor, Chen Sheng and Wu Guang started an uprising in Dazexiang to overthrow the Qin dynasty due to the Qin government's brutal and oppressive policies. Although the revolt was crushed by imperial forces, several other rebellions also started consecutively all over China over the next three years. The last Qin ruler, Ziying, surrendered to a rebel force led by Liu Bang in 206 BC, bringing an end to the Qin dynasty. Several of the rebel forces claimed to be restoring the former states that were annexed by Qin and numerous pretenders to the thrones of the former states emerged. In 206 BC, Xianyang was occupied and sacked by the forces of Xiang Yu, a descendant of the Chu general Xiang Yan. ↑ A minor state established in 228 BC by remnants of the fallen Zhao state. ↑ Believed to be Fan Yuqi. ↑ Dukang is the most fertile land in Yan. Crown Prince Dan pretended to cede the land to Qin to put Qin off guard, as well as to help Jing Ke gain Ying Zheng's trust so that Jing can get closer to the king and assassinate him. ↑ Fan Wuji is believed to be Huan Yi, the Qin general who fled to Yan to escape punishment after his defeat during Qin's conquest of Zhao. ↑ Some accounts claimed that Xiang Yan committed suicide after his defeat. 1 2 3 Li & Zheng 2001, p. 184. ↑ 秦灭韩之战 [Qin's conquest of Han] (wiki) (in Chinese), Hudong Baike . 1 2 3 4 5 6 7 8 秦灭赵之战 [Qin's conquest of Zhao] (wiki) (in Chinese), Hudong Baike . ↑ Bodde 1987, p. 27. 1 2 3 秦灭燕之战 [Qin's conquest of Yan] (wiki) (in Chinese), Hudong Baike . ↑ Li & Zheng 2001, pp. 185–87. 1 2 3 4 秦灭魏之战 [Qin's conquest of Wei] (wiki) (in Chinese), Hudong Baike . ↑ Li & Zheng 2001, p. 187. 1 2 3 4 5 6 7 秦灭楚之战 [Qin's conquest of Chu] (wiki) (in Chinese), Hudong Baike . 1 2 3 Li & Zheng 2001, p. 188. 1 2 3 秦灭齐之战 [Qin's conquest of Qi] (wiki) (in Chinese), Hudong Baike . ↑ Li & Zheng 2001, pp. 214–17. Bodde, Derk (1987), "The State and Empire of Qin", in Twitchett, Denis; Loewe, Michael, The Cambridge History of China, I: the Ch'in and Han Empires, 221 BC – AD 220, Cambridge: Cambridge University Press, pp. 20–103, ISBN 0-521-24327-0 . Li, Bo; Zheng, Yin (2001), 《中华五千年》 [5000 years of Chinese History] (in Chinese), Inner Mongolian People's publishing, ISBN 7-204-04420-7 . Sima, Qian. Records of the Grand Historian.